Note: There is a slight difference with MS Word on Mac as the Cite-O-Matic will appear as its own toolbar. 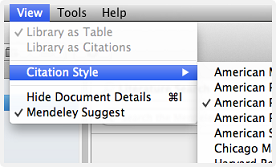 Click View → Citation Styles → More Styles to search for citation styles on Mendeley Desktop. Start editing your own citation styles with the open source Citation Style Editor. To get started we recommend this tutorial.